Yes! Lisbon Hostel ganó varios Hoscars en 2011, incluyendo el del albergue más popular de Lisboa, por lo que no es de extrañar que los usuarios de Hostelworld normalmente puntúen todos los aspectos del albergue por encima del 95%, desde la limpieza y la seguridad hasta la ubicación y la diversión. Nuestros usuarios frecuentemente elogian su "increíble, encantador y divertido" personal que habla inglés y español. A nosotros nos gustan sus cenas todas las noches por 10 euros, que uno de los huéspedes de Hostelworld dijo que son "como en un restaurante de 5 estrellas", e incluso tienen opciones vegetarianas. También ofrecen chupitos gratis todas las noches, té, café y chocolate gratis, visitas a pie gratuitas y salidas de pubs. In Yes! 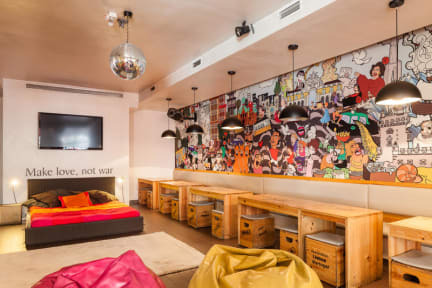 Lisbon Hostel you can relax, have fun and party in the lounge and bar and then get a good night\'s sleep in our quiet and comfortable rooms. The next day you\'ll be fresh as a daisy, ready to explore Lisbon\'s most important attractions, all within walking distance! Travelling alone? Don\'t worry; you\'ll meet loads of people in our lobby and at our special events, like the Free Walking Tours, Pub Crawls and the Famous Dinners! Please note that if you booked with a debit card or PayPal, please warn us if you will be arriving more than two hours after your stated time of arrival. Otherwise your booking will be cancelled and the beds released. Please email or call us if you\'ll be arriving after midnight. Towels available for 2 euro rental. The famous Yes! dinners available every night, all included for a fair price. Tours to Sintra and the beach in the Summer. Walking Tours with Soraia every morning. Free shot at 10 pm. If you have a group booking, we will always try our best to put you together in the same room, but keep in mind this is a hostel and that\'s not always possible! There is a mandatory 5 Euro refundable deposit for the keys. Towels are also available for a 5 Euro refundable deposit. We provide group dinners at the hostel around 21h for €10 including a starter, main dish and dessert plus three drinks of your choice. Great hostel, great people, great location! El mejor hostel al que he ido, realmente no puedes ir a lisboa y no quedarte en este hostel, el personal muy amable, siempre con una sonrisa, Pedro, Renata, Fabio, un amor, las cocineras tambien, los guías turísticos Fabio y Rui, que me tocaron a mi, realmente buenos, un ambiente inmejorable, las areas comunes grandes, se da para conocer a mucha gente, muy rico el desayuno y la cena y muy baratos, las camas, lockers y baños muy cómodos. Me voy de Lisboa con el corazón lleno gracias a Yes Lisbon! absolutamente todo estuvo perfecto !! De lo mejor en hostales. gran atencion, incluso tienen medicamentos. I had a nice experience in Yes! Lisbon Hostel. The attention was very good, great breakfast, good night atmosphere and clean rooms. The staff was friendly and helpful! Great location!